WhatsApp Messenger as we know is a cross-platform mobile messaging app which allows you to exchange messages with your relatives, friends, etc, without having to pay for SMS. WhatsApp Messenger is available for iPhone, BlackBerry, Android, Windows Phone, PC and Nokia. It lets you post status updates, images, videos and your location all of which are instantly shared with your friends. As we know that Whatsapp is primarily a Smartphone app with versions for Android, iOS, Windows Phone, BlackBerry, Symbian and PC. We are writing this post to help people who find it difficult or impossible installing Whatsapp installation file on their s40 java phones especially Nokia Asha single SIM, dual phones and other s40 non-supported java phones. Unfortunately for Java phone users, Whatsapp is primarily a smartphone app with versions for Android, iOS, Windows Phone, BlackBerry and Symbian. 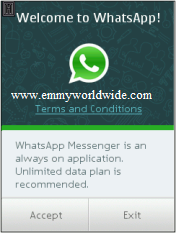 ==> Click here to download Whatsapp installation file. This setup has been zipped so you need to copy it into your memory card or pc to unzip it. ==> Navigate to the extracted folder, hold on, do not run the whatsapp setup inside the folder. ==> Move the application from its location in your memory card to your My Apps/Games folder. ==> Go back to the initial folder and hit the delete button on it. ==> Open your phone MENU and go to the Whatsapp application. Click on the options icon and then update the app. ==> After the software update run the app, follow all setup instructions and wait. ==> While the app is loading, you will be get an update error, notifying you that your phone model is not supported. ==> Just close it, your whatsapp is fully installed and working. Note: If you find it difficult unzipping the Whatsapp folder you can try this unzipped versions. Click here and here to download the set up file. After successful download, copy them to a folder in ur SD (memory) card. Rename WhatsApp_jar to WhatsApp.jar, also rename WhatsApp_jad to WhatsApp.jar. If both the zipped and unzipped files do not work for you, another way out to install whatsapp on phone is to download directly from Nokia Store. ==> After successful download and installation, Run your whatsApp, register your number and keep in touch with those friends you’ve longed to. Note: Some S40 phones do not copy, they move. We believe this tutorial guide on how to install Whatsapp Messenger on your nokia phone like asha single SIM, dual phones and other s40 non-supported java phones, worked for you.